A list of distinguished awards and accolades recognizing our Facilities Management Department's hard work and outstanding staff. Onondaga in Indian Quad is the first low-rise residential building on campus to achieve LEED Gold, a noteworthy achievement for an existing building renovation project given the envelope and historic preservation constraints. The building is estimated to use 21% less energy and 43% less potable water than a baseline code-compliant building. Additionally, the project diverted 80% of construction waste from landfill by recycling, reusing, and salvaging materials. The environmental and indoor air quality impact of the materials used on the project was improved by achieving 24% recycled contents in materials, 68% FSC certified wood, and low-emitting adhesives, sealants, paints, coating and flooring systems. Building 25 became the first building at the University to achieve the highest LEED certification. The project reused the existing building shell to create an energy-efficient and sustainable building that consume 39% less energy and 37% less water than a similar code-compliant design. During construction, the project reduced its environmental footprint by diverting 77% of the construction waste from landfill, used 34% recycled content in the construction materials, sourced 20% of the building materials from within a 500-miles radius, and used Forest Stewardship Council certified wood for 64% of all wood used on the building. In addition, use of low-emitting adhesives, sealants, paints, coatings, flooring, and composite wood improved the indoor air quality of the building. The parking lot utilizes porous asphalt to improve storm water quality. The inviting main staircase and the walkability of the project neighborhood promote active design and healthy lifestyles. The building incorporates energy monitoring systems to measure and verify building’s energy performance and ensure that the building continues to perform at its intended level. The Capital District Regional Planning Commission awarded the Stormwater Coalition of Albany County with a 2017 Erastus Corning 2nd Achievement Award for Intermunicipal Cooperation. UAlbany has long been part of this intermunicipal stormwater planning and implementation group charged with coordinating planning and compliance with the Clean Water Act and SPDES permits. As one of 12 members who form the Stormwater Coalition of Albany County, the University is committed to environmental stewardship and the implementation of green, sustainable best practices. The other members of the coalition include: the City of Albany, Town of Bethlehem, City of Cohoes, Town of Colonie, Village of Colonie, Village of Green Island, Town of Guilderland, Village of Menands, Town of New Scotland, City of Watervliet, and the County of Albany. Mohawk Tower is the first high-rise residential tower on campus to achieve LEED Gold, a noteworthy achievement for an existing building renovation project given the envelope and historic preservation constraints. The renovated tower features 2,200 new windows, wall insulation where none existed, heat recovery ventilation system, LED lighting, and water efficient plumbing fixtures including dual flush toilets. The building is estimated to use 33% less energy and 40% less potable water than a baseline code-compliant building. Additionally, the project diverted more than half of construction waste from landfill by recycling, reusing, and salvaging materials. The environmental and indoor air quality impact of the materials used on the project was improved by achieving 35% recycled contents in materials, 70+% FSC certified wood, and using low-emitting adhesives, sealants, paints, coating and flooring systems. Service Building A, Office of Facilities Management, was awarded Green Workspace Gold level certification by the Office of Environmental Sustainability for achieving high levels of sustainable practices in the workspace. Facilities Management is the largest workspace to receive a certification in the Green Workspace Challenge as well as the first whole-building workspace to be certified. The BuildSmart NY program, developed by Governor Cuomo to advance energy and efficiency goals in State buildings, has awarded Bob Nolin, UAlbany Plant Utilities Engineer, Chief Engineer, with the “Facility Star” award for Bob’s dedication and problem-solving to implement our annual Intersession Energy Initiative. Way to go Bob! 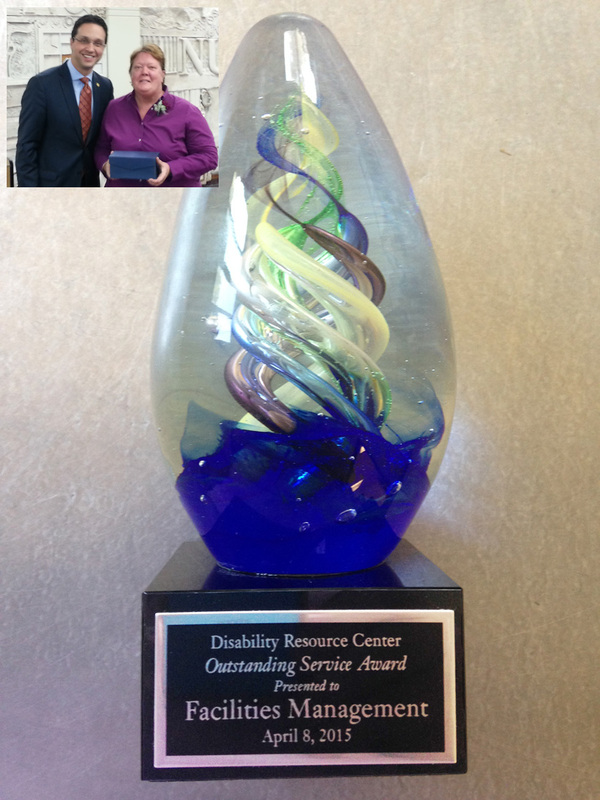 The Facilities Management Office received recognition by the Disability Resource Center on April 8, 2015 for its dedicated work through the extremely harsh 2014-15 winter, braving extremely cold temperatures and snow conditions, keeping handicapped accessible paths and parking spaces clear of snow and ice. February 2015 was particularly brutal, the second coldest on record, with an average daily temperature of 12.7 degrees. Accepting the award was Nancy Dame, Assistant Director of Physical Plant and Supervisor of Grounds. The Grounds Department and the Custodial Department, along with Mechanical Repair and Vehicle Operations, bear the brunt the snow and ice work and very capably handle the challenge of a 420 acre, 155 building campus, with over 7,200 parking spaces and 11 miles of roadways. This innovative award is a particularly high achievement for a building that houses a data center. Of note, the building includes daylighting, heat recovery chillers, energy recovery ventilation, economizer cooling, and high efficiency envelope, lighting fixtures and mechanical equipment. For more information on the project LEED scorecard, please visit http://www.usgbc.org/projects/relocate-university-data-center-albany. This stunning building, named one of the most beautiful of its kind in the world, includes a wide range of energy saving and sustainable features such as exterior fins and butterfly skylights designed to maximize daylighting but minimize glare and heat gain, triple pane glazing, displacement ventilation, heat recovery and demand based ventilation controls, high efficiency lighting with daylight and occupancy based controls, and 45% reduction in water use through high efficiency plumbing fixtures. This office building, one of the first to be constructed on the Uptown Campus, includes key features such as maximization of daylight, high efficiency lighting and mechanical equipment with controls, high efficiency plumbing fixtures resulting in 30% reduction in water use, and porous asphalt surface. in This 500 bed apartment facility, utilizes a geothermal heat pump system for heating and cooling and includes a green roof among many other sustainability elements that make it a model for sustainable student residential construction, receiving recognition from state and federal agencies. "IN RECOGNITION AND PROFOUND APPRECIATION OF DISTINGUISHED SERVICE BY UALBANY FACILITIES MANAGEMENT ADMINISTRATION AND STAFF DURING THE SNOW EVENTS OF WINTER 2015". UA Facilities Management demonstrated exceptional commitment to UAS, UAS corporate partners and to the University community in providing community-wide support and access to UAS facilities during difficult and extreme weather conditions and on multiple occasions. The award certificate can be viewed here. CSArch Architecture/Engineering/Construction Management received a Merit Award in the Renovation / Addition / Adaptive Reuse category at the annual design awards ceremony held in Troy NY. The event, which recognizes design excellence within the local built environment, took place Thursday, February 19, 2015 at The Arts Center of the Capital Region. The Design Awards Jury comments: "Clean, simple and purposeful; Nice use of light to foster collaboration; Very utilitarian and practical." 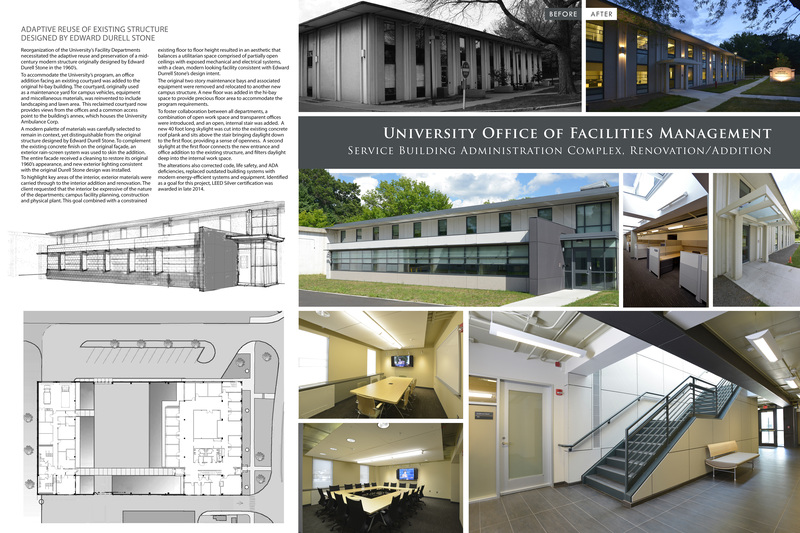 UAlbany Facilities Management's own architects, engineers and other staff worked hand-in-hand with the CSArch team to transform the fifty-year old building into a new vibrant and highly functional space. The project attained LEED Silver certification which was awarded in late 2014. Additional information about this project can be found on the Design Presentation Board or on the CSArch project page. The award was received for outstanding service to UAlbany and the concepts of Gender Inclusive Spaces. The Office of Facilities Management has worked with other campus units to provide Gender Neutral toilet facilities in campus buildings. The Lavender awards celebrate Lesbian, Gay, Bisexual, Transgender, Queer and Allied Faculty, Staff, and Students for their work in promoting LGBTQ Equity. The Awards are particularly special because they are chosen by LGBTQ and Allied students, faculty, and staff to recognize other student, faculty and staff contributions to the LGBTQ diversity at UAlbany. According to an online survey from TopManagementDegrees.com, UAlbany's School of Business is the 'fourth most beautiful business school in the world'. To learn more about the new business building project and see some photos throughout the different stages of the project, visit our featured project page. 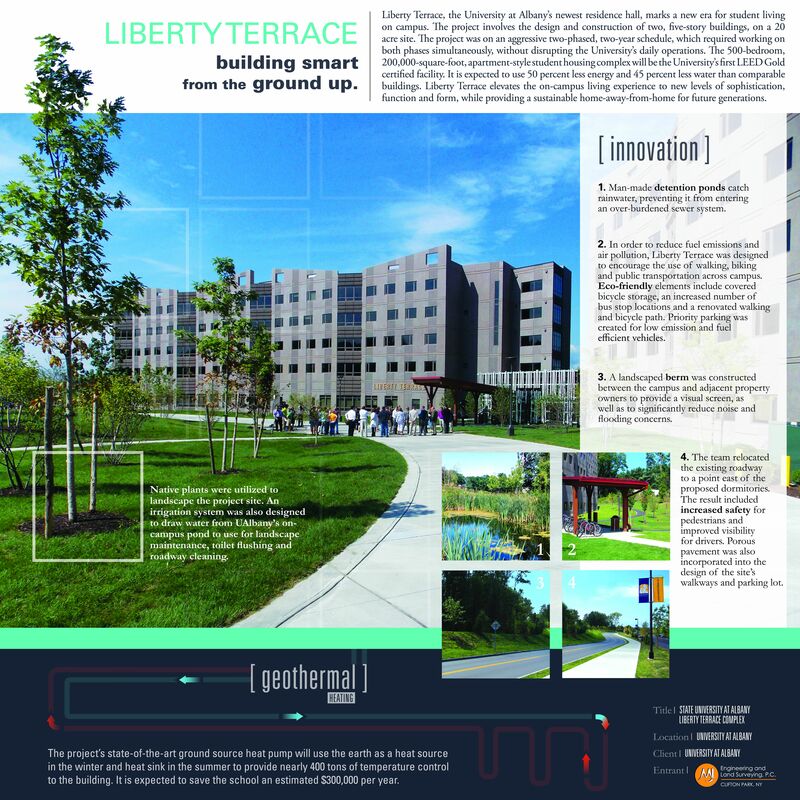 The Liberty Terrace project wins a Platinum Award, for engineering design services, and a Diamond Award, for modernizing the Univeristy's GIS database. The Liberty Terrace project, which debuted in August 2012, involved the design and construction of two, five-story buildings on a 20-acre site. The 500-bedroom, 200,000-square-foot, apartment-style student housing complex was the university's first certified LEED Gold facility. The project was on an aggressive two-phase, two-year schedule, which required working on both phases simultaneously without disrupting the university's daily operations. It entailed full site/civil design, bid document preparation and construction administration services. 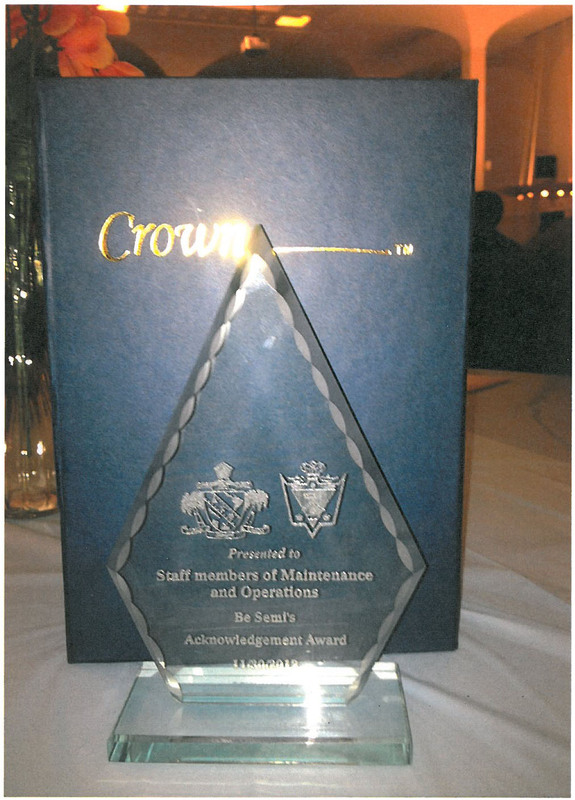 The Diamond Award is ACEC’s highest award. On the University at Albany GIS project, the latest technologies available were used to survey, including Real Time Kinematic (RTK) GPS locating and 3D laser scanning, as well as traditional survey methods. This complex project required using different technologies and making them work together to create a highly functional database. Liberty Terrace was built smart and utilizes renewable energy. As part of UAlbany's Sustainability Initiative and in accordance with NYS Executive Order 134, our custodial department has achieved Diversey's Healthy High Performance Cleaning (HHPC) GREENGUARD certification. If you would like to learn more about Facilities' Green Cleaning Initiative, please visit our Green Cleaning page. 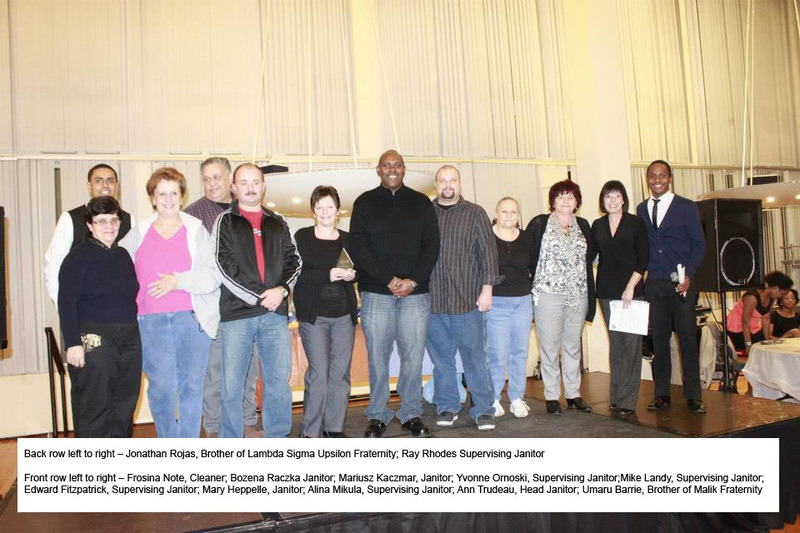 The Brothers of Lambda Sigma Upsilon Fraternity, Inc. and MALIK Fraternity, Inc. recognizes our Custodial department for exceptional service. 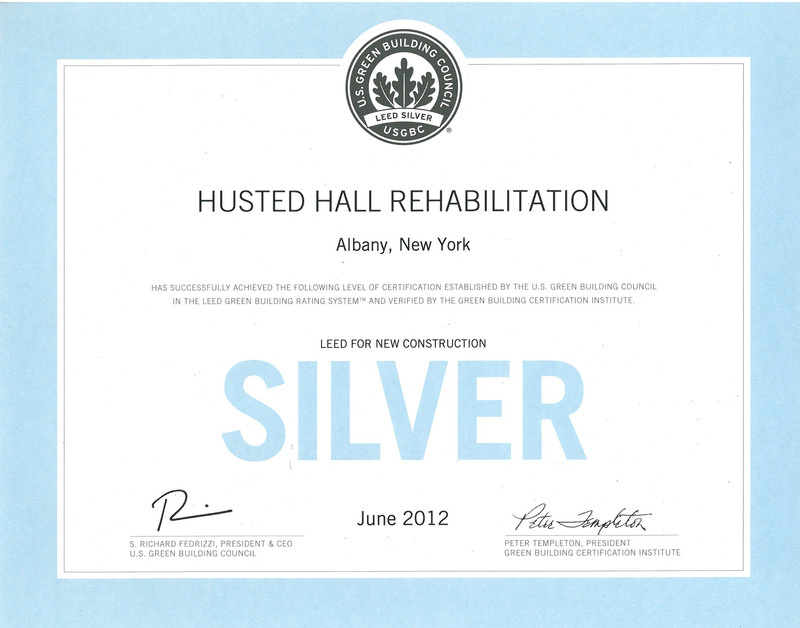 Husted Hall qualified for NYSERDA’s High Performance Building certification by achieving energy cost reductions of 30% or higher over the ASHRAE 90.1-04 code baseline. Husted Hall became the first building on campus to receive LEED-NC Silver certification for incorporating various energy and sustainability elements in the design and construction of the building. 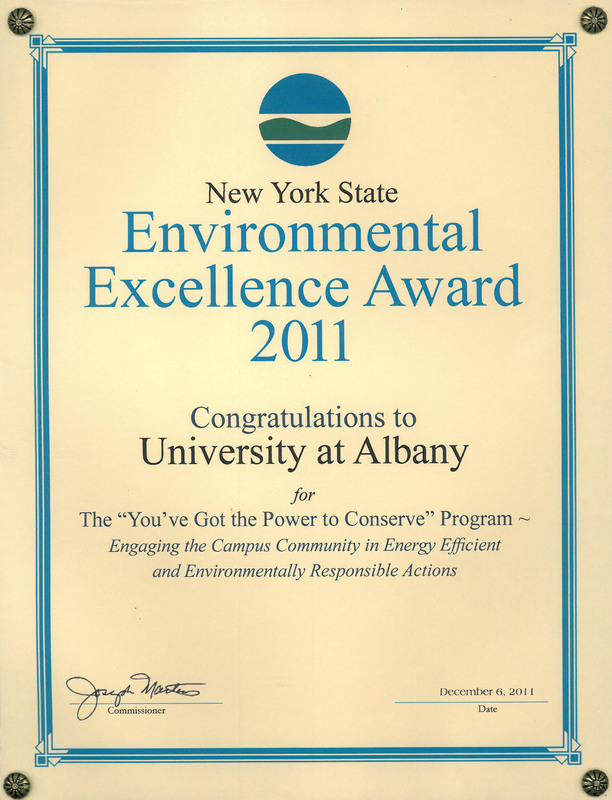 University at Albany received the award from NYS Department of Environmental Conservation (NYSDEC) for its “You’ve Got the Power to Conserve” program that engaged the campus community in energy efficient and environmentally responsible actions including the Intersession Energy Initiative and Fall Energy Campaigns.